French Onion Dip with Ramps | Good. Food. Stories. I feel like I’m going to get my professional eater card revoked for saying this, but… (whispers) I don’t really love ramps. I know! I can’t take it back! Call the cops, it’s already out there! Honestly, the annual media-led fever pitch (“OMG RAMPS!”) is almost enough to turn me off ramps forever, especially when I’d rather wait around for the garlic scapes to hit the market. And when the fragrant little buggers are going for $10 a pound, it’s easy to just say I’ll take my food dollars elsewhere. But free ramps? Hell yeah, I’ll play around with those. My dad, who never met a garlic clove or onion he didn’t like, routinely shows up at my door each spring with a gallon-size bag filled, and I mean filled, to the brim with ramp bulbs. Refusing a bag of freshly foraged ramps is really looking a gift horse in the mouth, don’t you think? So I’ve taken the semi-regular ramp donation as a challenge to find new ways to use them each year. I’ve pickled the ramps, sautéed and stirred them into compound butter, chopped ’em up and added them to all manner of sauces and salsas, processed them into pesto, and folded them into deviled eggs. This year, I decided to go the dip route, and dare I say, roasting the ramps may be my favorite way to prepare them thus far. Just like roasting garlic—a ramp’s brother from another mother—that sweet caramelization does a number on the bulbs, taming their more aggressive flavor and getting rid of the stringiness that turns me off when they’re grilled. 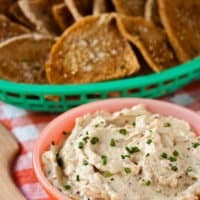 The recipe that follows is adapted from the classic French onion dip found in Classic Snacks Made from Scratch. In addition to the inclusion of ramps, this recipe lightens things up with the omission of mayonnaise and sour cream. It’s a more mellow variation on the pungent party starter we all know and love, and in keeping with this slightly tweaked version of the American classic, I’ve given the dip a more worldly chip pairing as well. 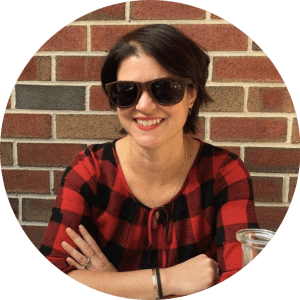 The tangy mustard butter that adorns the homemade pita chips is inspired by a popcorn recipe in Heidi Swanson’s Super Natural Every Day. Feel free to play around with the seasonings on your chips, adding sweeter or spicier mustard, a few shakes of Worcestershire if you want to make it saltier, or just leave the chips plain. 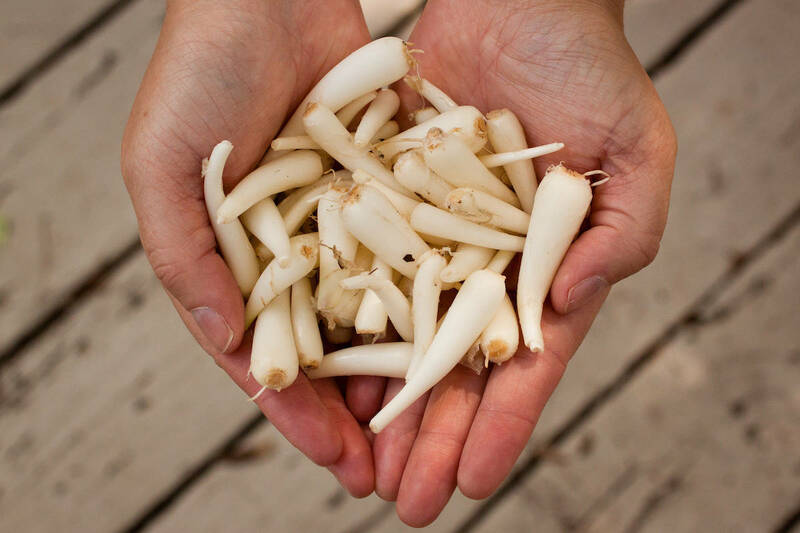 If ramps aren’t in season or aren’t available in your area, you can substitute other members of the allium family like peeled cipollini onions or small shallots, or the bulbs of young leeks or spring onions. 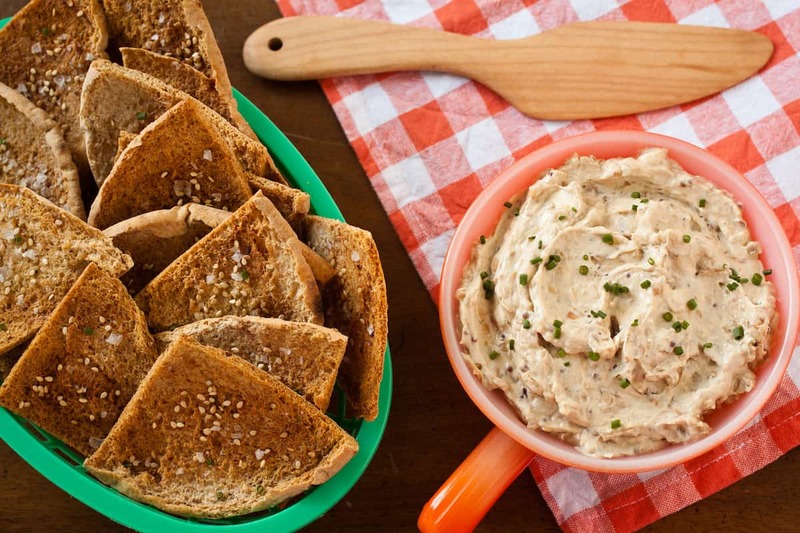 When ramps are in season, use the wild bulbs in place of regular onions in this refined version of classic French onion dip. Preheat the oven to 400 degrees F. Line a small rimmed baking sheet with parchment paper or a Silpat liner. Toss the ramps and garlic with the olive oil, balsamic vinegar, and 1/4 teaspoon each of salt and pepper. Spread the ramps evenly in a single layer on the baking sheet and roast for 30-45 minutes, until the ramps are tender and deeply golden brown. Let the ramps and garlic cool to room temperature. Peel the garlic and chop with the ramps into a coarse paste before assembling the dip. Stir the cream cheese, Worcestershire sauce, both mustards, and salt together in a medium mixing bowl until the cream cheese is blended and no longer lumpy. Stir in the yogurt and chopped ramps and garlic. Taste and add more salt and pepper if you wanna. Sprinkle with chives before serving if you're so inclined. 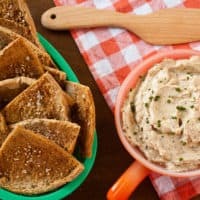 Eat with pita chips (recipe below) or other crackers, crudité, ruffled or un-ruffled potato chips, or just scoop some out with your finger. Not that I've done that. 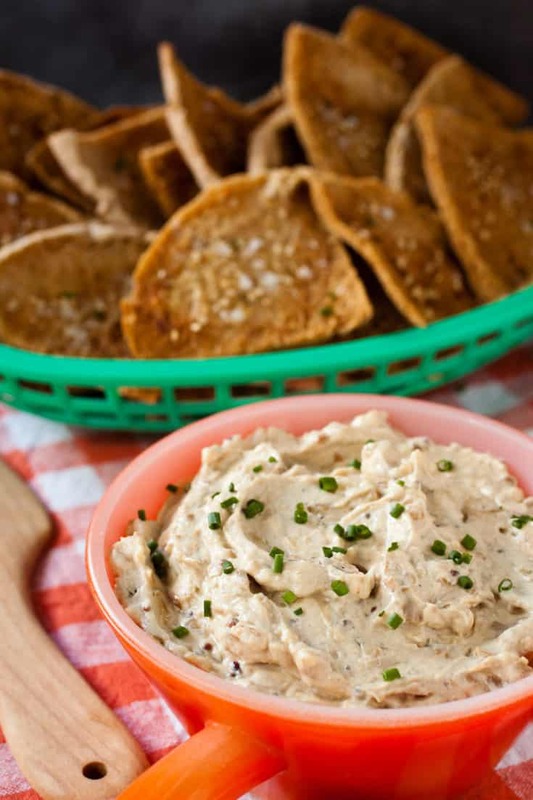 Sesame mustard pita chips are a perfect pairing for French onion dip or just for snacking on their own. Cut the pita bread into quarters and gently pull each pita triangle apart to separate it into 2 thin halves. Line the halves, "inside" side up, on 2 large rimmed baking sheets. Melt the butter in a small saucepan over low heat, then add the mustard and pepper and whisk until blended. Brush the pita halves with the mustard butter and sprinkle evenly with the sesame seeds and Maldon salt. Bake for about 10-15 minutes, until the pitas are browned and crispy. Start checking on them after 10 minutes; some chips will brown faster than others. Cool the chips on a wire rack before serving and sprinkle with chives if you're so inclined.